1.Combine marinade ingredients in food-safe plastic bag. Place beef steak in marinade; turn steak to coat. Close bag securely and marinate in refrigerator 6 hours or as long as overnight, turning occasionally. 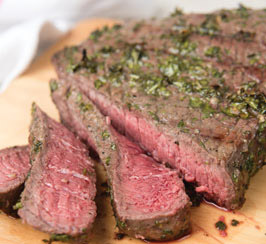 2.Remove steak from marinade; discard marinade remaining in the bag. Place steak on a gas grill (preheated to medium); arrange onions and asparagus around the steak and cover. Grill steak, 16-19 minutes for medium rare (145°F) turning occasionally. Grill onion wedges, 15-20 minutes, turning occasionally. Grill asparagus, 8-12 minutes or until crisp-tender, turning occasionally. 3.Toss onions and asparagus with 3 tablespoons vinaigrette. Carve steak across the grain into thin slices. Season with salt and pepper, as desired. Drizzle steak with remaining 1 tablespoon vinaigrette. Serve steak with vegetables.